We have too much stuff. I’m not going to sugar coat it. People come to visit me and I have to excavate a chair for them to sit down in. I wish I was exaggerating. So, my new passion is throwing stuff out. Or giving it away to others who will use it. I would say I try to sell my old/no longer relevant to us stuff, but it often seems like no one else is interested in my crap either. I had a yard sale this summer and still had a full truckload of stuff to take the our local donation centre. The best place, for me, to start culling things from is the girls “stuff” corner. They have a whole wall unit full of “stuff.” You know, half coloured in colouring books, 1000 crayons, markers, pens, and pencils, and every other craft-type thing they’ve ever been given. Oh, by the way, that’s 1000 EACH of crayons, markers, pens, and pencils. And then there are the few pencil crayons, pastels, paints, paintbrushes, glue sticks, piles of construction paper, scrapbooking stuff (that they’ve never even opened), kids needlepoint sets, clay, other packages of generic “craft supplies” and a big thing of scissors that each cut paper with a different pattern on the blades. I ask them to go through their stuff, so they find one colouring book and 3 broken crayons and tell me it’s okay if I get rid of those. While that’s lovely, that is NOT helping our home be more tidy! My children are going to visit grandma and grandpa the week before school starts up again. Patrick and I will be working, as usual, but this leaves our evenings free. Guess what I’m going to be doing?? You got it – getting rid of crap! I told Emma that if I think it’s garbage (and now I’m talking about her bedroom), that’s where it’s going. I’m pretty sure there are items that have been on her floor for months, if not years, that are just waiting to be loving placed in the trash bin. So that’s where I’m starting. I’ve been thinking about this purge tidy for a little while now and I have some ideas of how I can keep the kids on my tidy train. Start with a clean slate. If this means you need to get in there and do a first purge/clean out, do it! I know it’s not ideal – kids need to learn responsibility for their own stuff and all that, but at this point I need to just get in there and sort/toss/put away/realign/alphabetize (okay, now I’m just getting carried away!) everything in the bedrooms. Then we’ll develop a system – hopefully. Use less organization items. I know that sounds backwards, but it’s what is saving me right now. If there are less bins to just toss things into, you have to work a lot harder at finding a home for whatever it is. If it doesn’t have a home, do you really need it? 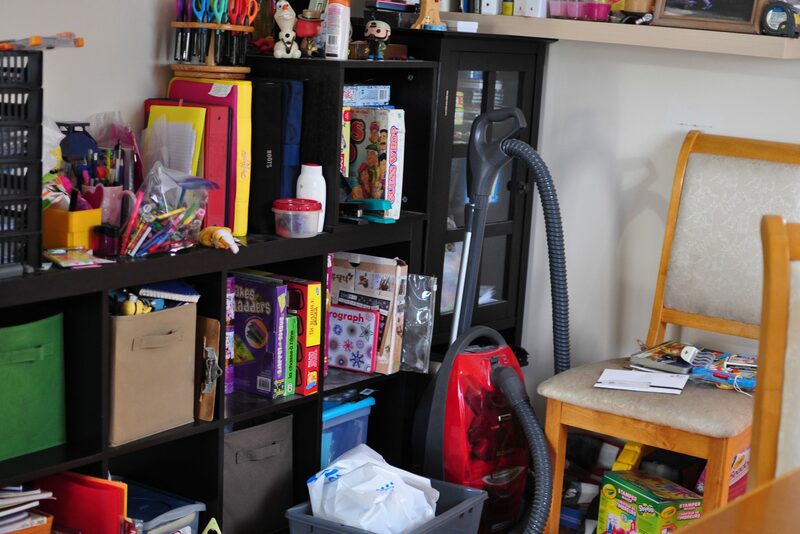 Once you get to the level of tidiness you’d like to maintain, create a schedule for everyone. Whether it’s so many minutes a day, or so often in a week, find something that works for your family, and stick with it. The minute you stop working towards the tidy goal is the minute the universe returns to chaos! And reward the kids. If they’ve gone above and beyond (gotten rid of a ton of toys, sorted through all their shelves of books, or actually spent hours working alongside you in your efforts) reward them for their hard work. I’m not saying pay them – just be sure to praise their effort, make them a dinner they actually like, or just put on a favourite movie when you’re through for the day. But be sure they understand that this reward is because of all their hard work. Maybe they’ll be more likely to help you out again with little to no fuss! This is the other end of my “living space.” The dining room table is just to the left of this photo. And yes, that’s the chair I need to excavate when people come to visit. It’s not at full crap-acity in this photo. Do you have any tricks you use to get kids organized? Or to keep them organized? I know sometimes we’ll get motivated to tidy up, but then there’s no follow through. Maybe that’s just because I’m lazy. And I am lazy. But now that the girls are older we should be able to keep things more neat (and more minimal) than when the house was full of baby toys! Share your tips in the comments – I need as much help as I can get! I find it a never ending battle, I get fed up of asking the girls to tidy their room and then end up doing it myself, only to find it a mess five minutes later. My living room is also a place where we keep toys and books for the kids, I’m not one of those mum’s that makes them put them upstairs every time, but sometimes I wish I was. I just keep thinking, a few more years and they won’t really need toys anyway and i can have my space back! I hear you Jess! I am constantly picking up after the boys. It’s like following a tornado. 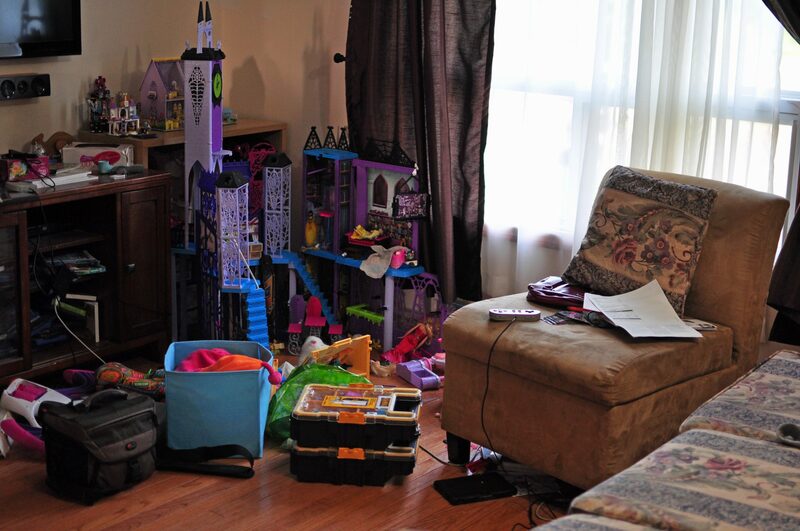 I even made one our rooms into a play room and the toys still spill out of there into the other rooms. I try to contain stuff to the “play area” but the kids think the entire house is a play area…we’re working on it, slowly. I know, right? Stuff seems to multiply. It drives me crazy! I think living with less is awesome, but I am first to admit that with kids it can seem impossible, they just accumulate so much, craft is one of the worst, they seem to get it in truck loads as birthday and Christmas gifts from friends. I also find stuffed toys hard as mine get very emotionally attached to them so it is really hard for them to donate them. Moving house helps as we are forced to sort crap out, but we can’t do that once every 6 months lol. One thing that helps is when I do a big clean of my wardrobe it seems to inspire them to want to clean out as well. Although my son decided he didn’t need his ‘good pants’ and wanted to get rid of them! Thanks for joining #mg and keep us updated with your progress! Leading by example is so great. I try to keep my own room “tidy” (though I often fail) so the kids can see how nice it is when every surface isn’t covered in stuff! I have 2 small kids now.Decluttering with 1 was difficult. My idea is to just buy fewer things this time around. Sending minimalistic vibes your way! Thanks Namratha! It’s slow work, but I feel we’re making baby steps of progress! It’s terrible. I get rid of so much stuff but it never seems to make a difference. Though I’m glad one of my daughters cares about a tidy room! I am literally doing this at the moment! I have gone into my daughters room and got rid of loads of stuff while she was out and there is still a lot to go! It’s time for me to go through rooms again. We are very slowly getting better, but there’s still a long way to go. I’m letting go of more of the “art” and school stuff that gets brought home. There is just no room and way too much stuff! No one ever seems to want my stuff either. I’m not sure how others manage to actually get rid of their stuff that way. It all gets donated here – clothes passed down and stuff to thrift shops. I’m still working on it here. This is a problem with us, including a lot of leaves, sticks, and conkers thrown in for good measure! Hi, thanks for sharing on #BestBootForward – don’t forget to link back to us – you can grab our badge from the page or use a hyperlink. Some great tips which will help those of us looking to sort out in the new year! Happy to link up Chloe! That’s a great rule. My girls’ rooms are so small I can barely fit all their clothes in them – so that would really cut down on the amount of toys they’d have. We’ve done a good job over the last year reorganizing, and getting rid of some stuff. It’s still a work in process! We definitely have too much stuff too. Cleaning out all the toys from the basement was my big getting rid of the stuff project! It’s great when you can get through a project like that. We’ve done a lot, but there’s always more to do!